Sometimes, just occasionally, I change my mind. While the didactic style of some of these postings might suggest a singleness of purpose, an almost obstinate point of view, I am open to the possibility of evolution. The stuffing of a handkerchief is one such occasion. In one of my earliest posts on this blog, Tips on Stuffing, I outlined the three most popular ways to arrange a silk handkerchief: pulling the centre to the bottom of the pocket, thus exposing the points; vice versa, exposing the puff; and combining the two by folding the handkerchief in half, displaying both the centre and points. I used to be a puff person. Exposing the points seemed a little affected except on a special occasion (my wedding, for example, though that was a linen handkerchief). And the folded, combination option does not leave anything at the bottom of the pocket and therefore tends to slip down during the day. The puff was practical by comparison and a little more understated. However, it had a number of weaknesses, chief amongst which was that differently sized hankies would puff at different heights out of the pocket. The tips could be folded down inside the pocket in order to adjust the height, but that rather defeats the simplicity of the technique and could take a few attempts to get just right. Instead I revert to what I have christened the Lazy Fold. Stuff one corner of the handkerchief into the pocket until you feel it touch the bottom. Then fold over the rest and stuff it behind, leaving as much silk exposed as you desire. As a footnote, I also find that if I want to highlight the border pattern of the handkerchief a fold is better than a stuff. This is in direct contrast with my previous posting, which advocated exposing the tips to achieve this effect, and relegated folding to cotton or woollen handkerchiefs. That is the traditional approach. But in this case I believe I was (whisper it) wrong. It is very hard to display the points of a silk handkerchief without it appearing affected, at least in a business setting – which is where I would be wearing mine almost exclusively. Try a normal TV Fold instead, with the edges uppermost; it is more subtle. I consider myself evolved. You can follow the discussion on Introducing the Lazy Fold by entering your email address in the box below. You will then receive an email every time a new comment is added. These will also contain a link to a page where you can stop the alerts, and remove all of your related data from the site. If I may ask you, where did you obtain that fantastic handkerchief, in such a perfect pale blue, that you have illustrated here as an example? Thanks in advance. Hi Nicola – I believe it is from Paul Stuart. 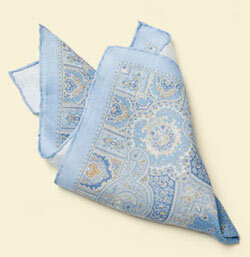 For my money, Etro still makes the loveliest handkerchiefs though. Simon, what’s the best material for a handkerchief if you want to wear it (in a TV fold) with a dark grey wool suit? Cotton or linen? What’s damaging about the “pochette” pocket square is that once you get the hang of it (not necessarily mastery)you feel rather incomplete without one. You’re absolutely correct in mentioning that it must look as if you gave it no thought whatsoever. It should usually always be cotton in this type of fold. I would go with that as your default, only switching to silk if you find the Lazy Fold unsatisfactory. By folded neatly, what exactly do you mean? Isn’t the TV fold a neat fold? In your introductory post for the style guide, what kind of handkerchief is Mats Klingberg wearing? Cotton? Yes, it is a neat fold. Mats generally wears a cotton hank, yes. So, could you tell me if I’m correct: presidential fold=cotton; lazy fold=silk or linen; stuffed square=cotton as well or linen? Thank you! The square, presidential fold could be used for cotton or linen, but not silk. The stuffed square can be used in exactly the same way, for the same materials, and I prefer it because it doesn’t look so forced and pre-arranged. The lazy fold is just for silk. But there are many other ways to wear both silk and linen. In particular, stuffing with the points pointing outwards. But didn’t you say that linen was too stiff for the presidential fold (which, as far as I know, is the same as the TV fold)? And if I understand your description correctly, isn’t the lazy fold in the end just another type of puff? It’s not always obvious without images. Thanks for the clarifications. Linen can be fine as a TV fold, but not for a puff (points downward). Yes, the lazy fold is another type of puff. But the points are always inwards. Sorry, I must be a little slow, but I didn’t quite get the lazy fold, could you expand on it a little ? When you say “then fold over the rest and stuff it behind”, fold over how ? Having the three other ends rejoin the one you already stuffed, The final result exposing only the center ? I always wear a square, mostly silk since I wear lots of tweed and I like the contrast, but I’m still looking for the right way to fold it. Don’t worry Nathan, this clearly needs video! Yes, just push off the rest of the hank behind, as far down as you need to. Fold is the wrong word really. And yes, it exposes whichever part of the middle you prefer. Personally I don’t tend to wear squares, particularly with silk. Well thank you for all the explanations anyway (but you’re right a video would still be a great addition to this post). Oh and I happen to just have gotten the Drakes Unicorn square you show in your last post as a christmas present and am already quite fond of it. Now I got it ! It was indeed a miscommunication on MY part. To me, a square was synonymous with handkerchief ! I didn’t know it was implying the way you wear it. And I totally concur with you on not folding silk handkerchiefs. I usually wear them the way Michael Alden wears them (http://dresswithstyle.com/2010/01/02/mens-style-have-a-handkerchief-always-handy/), but they do indeed tend to slip down after a few hours. Well, thank you very much for your patience and you time.